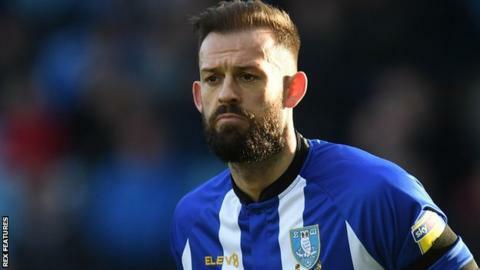 Steven Fletcher's first double since April 2017 was enough to give Sheffield Wednesday all three points against Brentford at Hillsborough. Fletcher opened the scoring for the hosts just before the break, pouncing on a fine pass from Barry Bannan and diverting the ball past Dan Bentley in the Brentford goal. And the Scotland international grabbed his second shortly after half-time, heading home Adam Reach's out-swinging cross. Said Benrahma had a handful of chances to pull a goal back for the Bees but was unable to beat Owls goalkeeper Keiren Westwood. Thomas Frank's side were coming off the back of a 5-1 win at home to Hull City on Saturday but it was Steve Bruce's Owls who started the brighter. Returning to the squad after a one-match suspension, Fernando Forestieri saw his curled effort sail narrowly over the bar in the opening minute. Fletcher also came close to an opener moments later, heading wide of the target at the back post from a Bannan free-kick, while Tom Lees had a header fly just over the bar after an Achraf Lazaar corner on 18 minutes. Going into the fixture, Sheffield Wednesday had lost their previous two Championship matches against Brentford but once they went two goals up the result never looked in doubt. Reach came inches away from doubling Wednesday's lead shortly before their second, placing Rolando Aarons' cross narrowly wide. And Reach then turned provider for Aarons who forced a fine save from Bentley mid-way through the second-half as the hosts pushed for a third. Westwood was eventually forced into two fine saves late on, keeping out Benrahma and Neal Maupay. The result means Wednesday go 12th in the Championship table, while the Bees remain 16th. "It was certainly the best performance since I've been at the club. From the first whistle to the last, I thought we were worthy winners. "Some of the stuff we played and the way we worked was terrific. I can't fault them for their effort and endeavour. They're working extremely hard and I can't ask for more. "We could have a really good end to the season. We've got a huge game (the Sheffield derby) to look forward to next Monday." "It's a very big disappointment. Fair play to Steve Bruce and Sheffield Wednesday - they pressed us very high, went man for man and we didn't have a solution. "We knew the solution, we just didn't do it. That made us extremely bad on the ball. I haven't seen us give the ball away so many times like we did today. "We looked without energy and we couldn't get back into the game. It was a well-deserved win for Sheffield Wednesday." Match ends, Sheffield Wednesday 2, Brentford 0. Second Half ends, Sheffield Wednesday 2, Brentford 0. Ezri Konsa Ngoyo (Brentford) wins a free kick in the defensive half. Foul by Rolando Aarons (Sheffield Wednesday). Foul by Dominic Iorfa (Sheffield Wednesday). Said Benrahma (Brentford) wins a free kick in the defensive half. Corner, Sheffield Wednesday. Conceded by Moses Odubajo. Offside, Brentford. Said Benrahma tries a through ball, but Neal Maupay is caught offside. Attempt blocked. Said Benrahma (Brentford) right footed shot from the left side of the box is blocked. Assisted by Josh Da Silva. Corner, Brentford. Conceded by Keiren Westwood. Attempt saved. Neal Maupay (Brentford) left footed shot from outside the box is saved in the bottom left corner. Assisted by Said Benrahma. Attempt saved. George Boyd (Sheffield Wednesday) left footed shot from outside the box is saved in the centre of the goal. Assisted by Steven Fletcher. Substitution, Sheffield Wednesday. George Boyd replaces Fernando Forestieri. Attempt missed. Said Benrahma (Brentford) right footed shot from outside the box is too high. Assisted by Neal Maupay. Foul by Ezri Konsa Ngoyo (Brentford). Steven Fletcher (Sheffield Wednesday) wins a free kick in the attacking half. Attempt saved. Ollie Watkins (Brentford) right footed shot from the right side of the box is saved in the bottom left corner. Assisted by Said Benrahma. Neal Maupay (Brentford) wins a free kick in the attacking half. Foul by Barry Bannan (Sheffield Wednesday). Attempt missed. Dominic Iorfa (Sheffield Wednesday) header from the centre of the box is too high. Assisted by Rolando Aarons with a cross following a set piece situation. Substitution, Sheffield Wednesday. Joey Pelupessy replaces Sam Hutchinson. Substitution, Brentford. Ollie Watkins replaces Sergi Canos. Substitution, Brentford. Josh Da Silva replaces Josh McEachran. Neal Maupay (Brentford) wins a free kick in the defensive half. Attempt missed. Sergi Canos (Brentford) header from the centre of the box is high and wide to the right. Assisted by Said Benrahma with a cross. Corner, Brentford. Conceded by Steven Fletcher. Corner, Brentford. Conceded by Rolando Aarons. Rolando Aarons (Sheffield Wednesday) wins a free kick on the left wing. Foul by Henrik Dalsgaard (Brentford). Attempt missed. Fernando Forestieri (Sheffield Wednesday) left footed shot from outside the box misses to the left. Attempt missed. Sergi Canos (Brentford) right footed shot from the centre of the box is too high. Assisted by Said Benrahma with a cross following a corner.